Dabble will automatically syncs your novels to the cloud. A complete copy is kept on your computer for speed and for offline use. Another copy is kept in the cloud, keeping your words safe from computer failure, and allowing you to work from multiple computers. When you make changes to your novel and when you write, Dabble saves these changes immediately to your computer. It will then sync these changes up to the cloud every 30 seconds. Dabble shows you the current state of your cloud sync in the top-right with a single cloud icon. An empty cloud with a slash through it indicates you are currently offline. None of your changes will be synced to the cloud in this state.Note: if you are definitely online but the icon appears this way, you can try refreshing (in the desktop or web app) using ⌘+R on Mac or Ctrl+R on Windows. If this doesn't help, it may be Dabble's services are down. An empty cloud indicates there are pending changes that waiting to be synced. This should change to a checked cloud in 30 seconds or after you click it.Note: clicking the cloud when not in this state will do nothing, since there are no pending changes or you are offline. An up arrow inside the cloud indicates data is syncing up to the cloud. A down arrow indicates data is syncing down to your computer. Large amounts of data syncing down will show a modal while things download since trying to use Dabble during lots of updates can be frustrating. Clicking on the cloud at any time will show a reminder list of the icon states and what they mean. 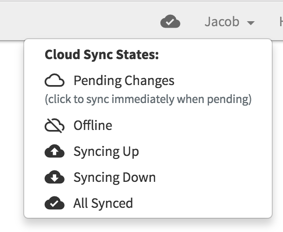 If you are finished writing for the day, if you are about to go offline, or if you just want to ensure everything is synced up to the cloud, you can click on the cloud icon in the top-right when there are pending changes and you are online. This will send the pending changes up immediately. Then you will be able to see those changes on any other computers you may use for writing. If you write in a scene while offline on one computer, make changes to that scene while online on another computer, and then bring the first computer online, the newest changes will overwrite the older ones. Dabble will merge changes to a project, but it does not merge changes made within a document (scene, page, etc). Be sure you get any changes made synced up to the cloud before working on the same document on another computer.